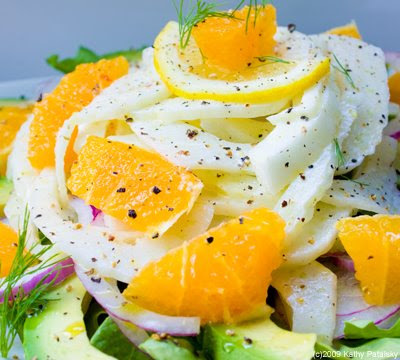 Fennel Arugula Citrus Salad. Gourmet Taste for Less! Fennel Bulb. I am in love with fennel. Eating raw fennel just makes my entire meal taste better because it cleans my palate and eases digestion. Read more about fennel, super food, here. 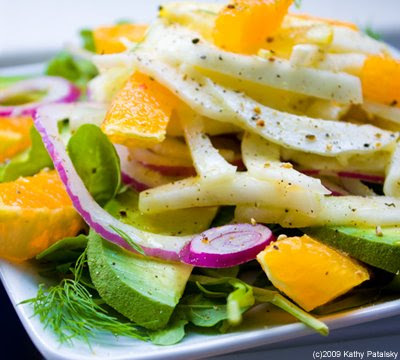 Citrus, Arugula, Avocado, Onion. 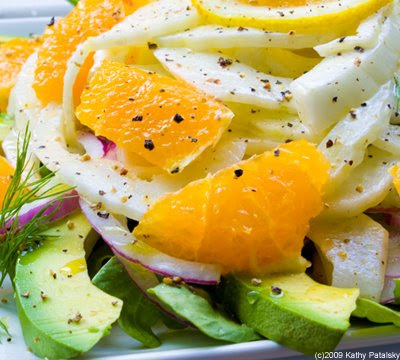 OK, so the fennel is the headliner ingredient in this salad, but don't forget the delicious accent flavors that are included. 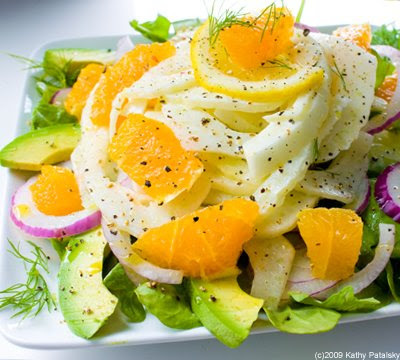 Creamy avocado, spicy light arugula leaves, a thinly sliced red onion and a delicious layer of sweet oranges. 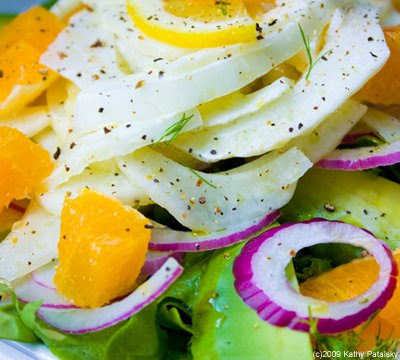 A hint of lemon juice, olive oil and black pepper make this salad soar with summertime flavor. Fennel Marinade. The only 'dressing' on this salad is really the marinade in the fennel. I also like to drizzle a bit or olive oil right over the arugula and avocados. My fennel marinade is not simply a lemon/olive oil blend. I also add in a drop of Vegenaise. The white vegan topping adds a subtle creaminess to the texture and it also enhances the natural white color of the fennel. It looks and tastes beautiful! Oh, and don't forget that fresh crushed pepper. If you are someone who loves spice, you can add in some cayenne or paprika. However, both of these spices will change the marinade color to a light orange-pink. Gourmet Taste on a Budget. So I recently had a Fennel Salad at Jean-Georges' Mercer Kitchen in SoHo, NYC. It's one of my favorite things on the menu. It was $9 and had mushrooms (and cheese which I request to be not added). They shave the fennel super thin. So delicious! But I wanted a larger portion of the salad (with my veggie add-ins) at an at-home price. 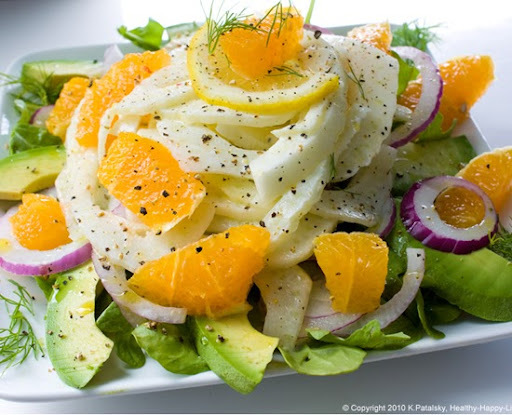 So here's how the cost breaks down: avocado: $1 per half, orange: 50 cents, arugula bulk: $1, red onion: 50 cents, 'dressing marinade' and fennel fronds garnish: around $50, lemon: 25 cents, half an extra large fennel bulb: $1.50. So basically, two servings of my salad costs around $5.50. That's only $2.25 per salad. No too shabby. Rub avocado with a bit of lemon juice to preserve color. Optional: Chop arugula leaves into smaller bits for an easier eating experience. Place the sliced fennel in a large bowl. Add vinegar, lemon juice, Vegenaise, salt, pepper and agave syrup. Toss well until each fennel slice is well coated. Lay a layer of arugula on the plate. Lay a circle of avocado spears in a circle around the edges of the plate-on top of the arugula. Drape a handful of red onion slices over the avocado spears and arugula. Drizzle a tablespoon or so of olive over top of the salad. Next, Spoon a nice portion of the marinated fennel on top of the salad. 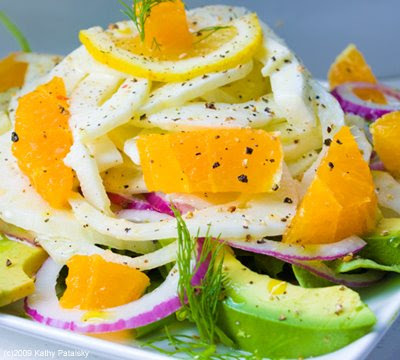 Place your orange slices on top of the fennel and around the edges of the plate. Garnish with a few fennel fronds and a lemon slice. Grind some fresh black pepper on top. You can drizzle the leftover fennel marinade on top of the salad if you'd like.